More than a gigawatt of solar energy — the equivalent of 3.125 million photovoltaic panels — will be needed to power those activities. However, because solar technology is currently the most expensive component on satellites, engineers and scientists are looking for ways to make solar energy in space affordable — and to keep solar power systems from degrading so quickly in the extremely harsh environment of space. Stanislau “Stas” Herasimenka, an Arizona State University postdoctoral researcher, thinks he has the solution to provide cost-effective and efficient next-generation solar power for space applications. 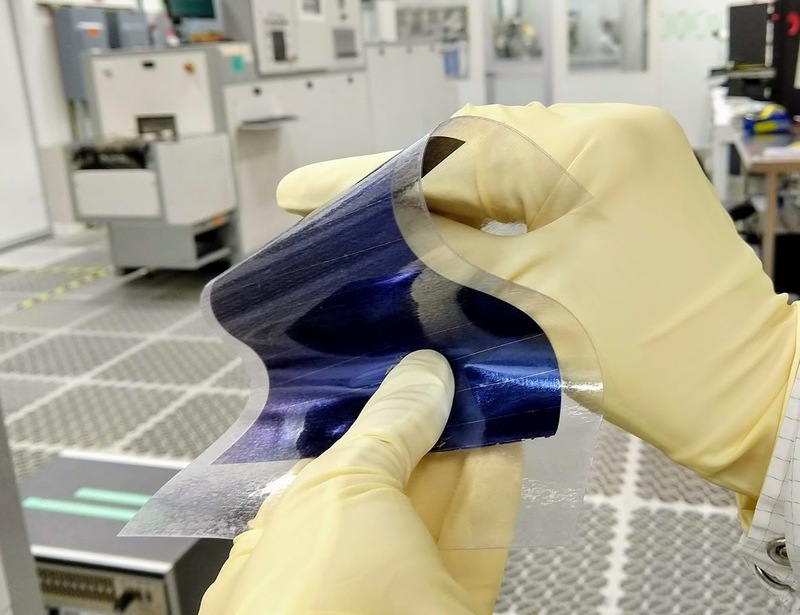 The thinness of a 20-micron-thick silicon solar cell prototype for space fabricated by Regher Solar at an ASU lab enables extreme flexibility. Photo courtesy of Stanislau Herasimenka. Pioneered in the 1990s, silicon heterojunction technology is not new but it’s not widely used in the commercial solar energy industry. Still, it holds great promise for the future of solar energy. In conventional solar cells, the current manufacturing efficiency is up to 21.5 percent. Herasimenka believes silicon heterojunction solar cell technology can be manufactured to attain as much as 24 percent efficiency without increasing the cost of production. While that would seem to be a small step, it’s actually the next giant leap the solar power industry is looking to achieve. Seeing this as an opportunity to apply his graduate studies research, Herasimenka founded solar cell technology startup Regher Solar with solar industry expert Michael Reginevich. It’s extremely complicated for a novel solar technology to enter the market. The current cost of a commercial solar panel is about 30 cents per watt. The current leading technology of solar energy in space is in the form of tandem solar cells, which are more efficient than terrestrial solar cells (28 to 32 percent efficiency), but they cost orders of magnitude more at $100 to $500 per watt. In comparison, Regher Solar’s silicon heterojunction technology is a great deal at $1 per watt cost even with the loss of about 7 percent efficiency. Not only is the price right, Herasimenka and his Regher Solar team have ideas in mind to make solar cells that are more resistant to the harsh environment of space that theoretically could also increase the cells’ end-of-life efficiency. Their research caught the attention of Albuquerque, New Mexico-based SolAero Technologies and the Air Force Research Laboratory’s Small Business Innovation Research (SBIR) grant program, which seeks to fund technology to implement a space transport that could shuttle spacecraft from low Earth orbit to higher orbits. The area through which the transporter would operate is also where radiation is most damaging to solar cells. While typical solar cells are 160 to 180 micrometers thick, Herasimenka and Regher Solar are targeting 50-micrometer or even 10-micrometer solar cells. Manufacturing thin, easily breakable solar cells requires special equipment that makes production more expensive than 30 cents per watt but this isn’t a problem for aerospace companies that now pay 500 times more for a solar cell. In 2011, the Quantum Energy and Sustainable Solar Technologies (QESST) center was established, with Honsberg as its director, to address the “terawatt challenge” and develop advanced clean energy technologies to help raise the living standards of people around the globe living in energy poverty. It is a collaborative consortium of eight universities, more than 100 students and 30 faculty working with industry to find energy solutions. Monique Clement is a communications specialist with the Ira A. Fulton Schools of Engineering at Arizona State University.